Almost two months in to 2013 and I have (almost) kept my new year's resolution of giving up alcohol for health and financial reasons. Last year I got through to the summer holidays (with a few minor blips) before falling off the wagon comprehensively. 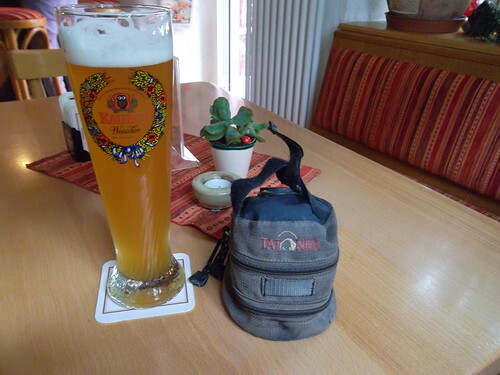 You see, I was in Germany for a few days and everywhere I looked there was beer on offer. Even the hotel where we stayed had its own brewery. 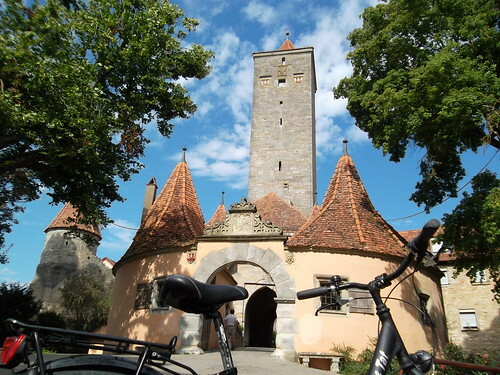 I was fortunate enough to take two short cycle rides around the Bavarian town of Rothenburg ob der Tauber. I have to confess that I until we looked to book the flight, trains and accommodation I had never heard of the place. I went there on a family holiday. Not for the first time in my life I did no research before arriving in town. The ground floor of the building shown above houses the Rothenburg Tourist Office. An employee there gave me a leaflet when I asked for a map of the Romantic Road (Romantische Straße). In fact, she gave me a leaflet for a completely different series of routes, but it didn't spoil my enjoyment of the rides I took. The woman in the tourist information office also told me that there was only one bicycle hire shop in the city (there are at least two more) and I went there for a sit up and beg bike. I managed to get lost and cycled off in a southerly direction before being put on the correct road by another cyclist. The road west from Rothenberg ob der Tauber falls away sharply on the route I took on day one over the double bridge on the way to Creglingen. By the time we had found the bike shop, got a machine in the right size and I had headed off in vaguely the right direction (initially at least) it was late in the morning. 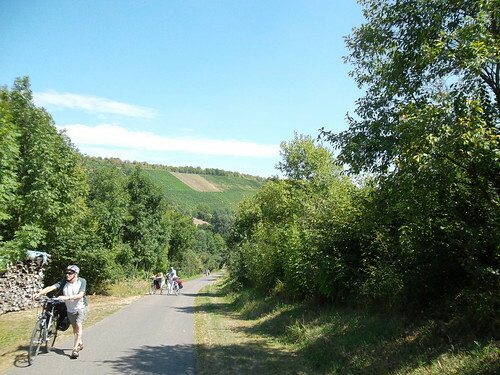 I upped the pace along the undulating course towards Creglingen; I wanted to be there by noon. At the place in the photograph above I ordered a cooling drink and the wrong food (on the menu it looked like chicken). I ate it anyway then thought I needed further cooling. After that I cycled round a bit before thinking it would be an idea to find some water for the return journey. I wanted fizzy stuff, found another cafe and tried to order it there. Being a simple soul and having little German I tried to communicate my needs with the nice lady behind the counter using the international language of mime (and, for some reason, a smattering of Italian). I was beginning to worry that I would get either a bottle of sparkling water or a few pounds of high explosives when a bored looking girl of about twelve years old looked up, said something that sounded like 'bubbly' and went in the back for a large glass bottle of sparkling water. Thank you very much, the German education system. 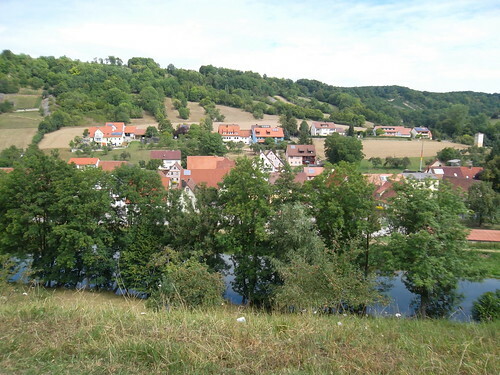 Time to set off back along the Tauber. 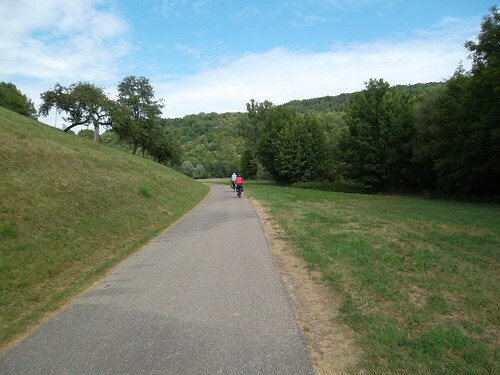 There were few road cyclists along the Romantic Road. Mostly it was middle-aged and elderly couples on heavy European tourers, mountain bikes or hybrids laden down with Ortlieb panners. Some looked as though they hadn't done a great deal of cycling in recent years. But a least the weather was kind for them. 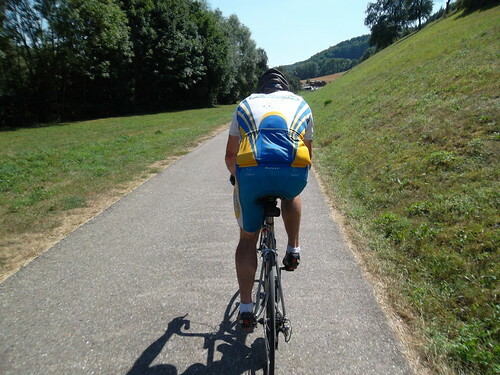 I was overtaken by one cyclist as I admired the view. With my large bottle in one hand, a camera in the other, and the handlebars somewhere in between, I clicked up a gear and set off at quite a pace after the chap in the photograph above. My legs and lungs were burning after about a mile of this but, sadly, I never got to see the expression on his tanned face when the roadie turned round to see a pink Englishman on his wheel, swigging a bottle of fizzy water and nonchalantly snapping the scenery. 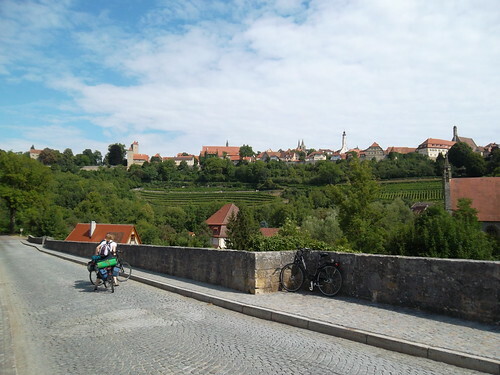 Eventually, I had to silently bid adieu (or whatever is the German equivalent) to the road cyclist and slacken off the pace, ready for the eventual short stiff climb up to Rothenburg ob der Tauber. 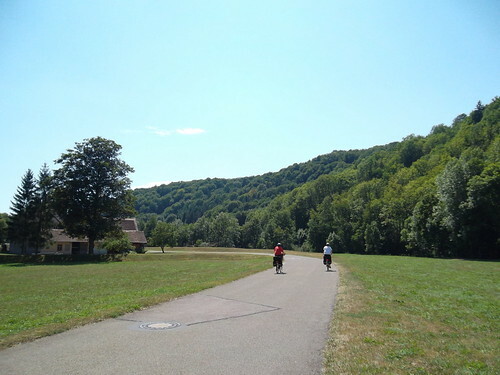 On the return leg of my out-and-back I went all the way up to the highest point towards the bike shop. However, I had an other hour or so on the clock, so I cycled back in to town to take some more touristy snaps. This gate (below) at the southern end has a charming stone carving depicting a figure with an open mouth. It was used to pour hot oil through on to unwelcome visitors during earlier times. Posted by Chris on February 12th, 2013. Nice post Chris. The photos are a useful reminder that there is a summer each year and a sun in the sky. I've never seen Chitty Chitty Bang Bang though. We've only ridden in Germany once and enjoyed it thoroughly. I think, Chris, you managed to get lost as often as we did. Great post. 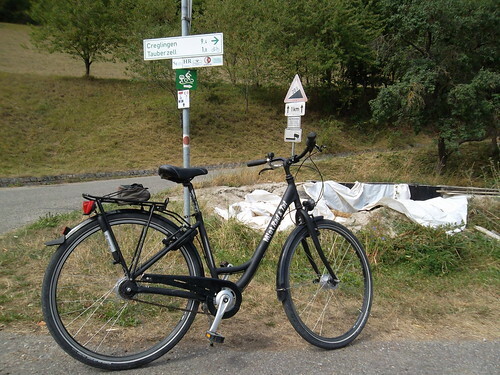 I like how you framed the bike in the Creglingen photo on the first page (note to self: steal that concept). I've been to Germany about 6 or 7 times, including doing the Romantische Strasse twice, once with two male friends and once with my wife. A fine and interesting tour. 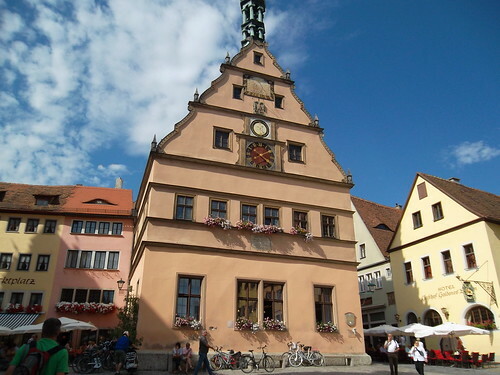 Rothenburg is the most impressive of the towns, but there are several other fine ones. I like German food, Ideal for cycling. What a brilliant idea! Why don't such facilities exist in Britain? I suppose for the same reason we don't have cycle paths like the ones in your photos either. I always find that the problem with holiday bike hire is finding somewhere nice to ride it and not getting too lost in the process. There were some hire bikes of a reasonable standard in Morocco but they only seemed to be intended for cycling along the promenade and there didn't seem much point in hiring a bike to cover 3 miles or so. Getting anywhere nice involved too much cycling along busy roads first to be very appealing. Lovely read, made me feel nice and cosy while the snow flakes consider fluttering down outside. Looks lovely and warm. Very interesting and those cycle paths look fab, if I found one like that Id be on it for sure. 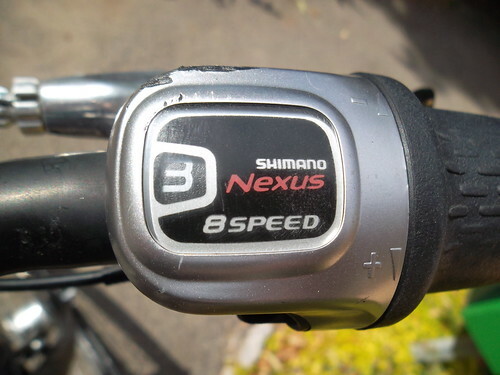 Did your hire bike only have one gear? Been ages since I have seen a bike like that one. A few of the photographs came out all right I thought. It helps when the sky is so blue and there are pretty things to point your camera at. We are looking to visit somewhere else in southern Germany in the summer, but it's proving difficult to sort out the transport this time. The hire bike was quite heavy and I struggled at times on this route. In fact, I was a little anxious more than once. Still, I reminded myself that many people will never cycle 50 miles in one day – whether on a shopping bike or not. Next time I hope to be more prepared. 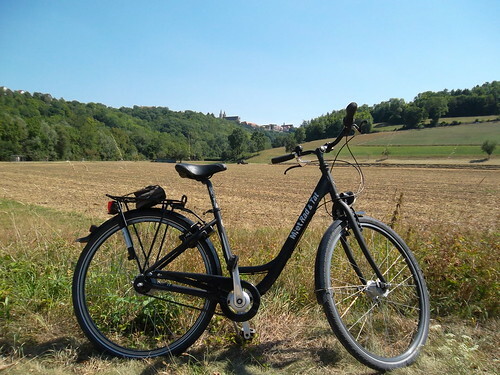 Mary wrote: Did your hire bike only have one gear? Mercifully no. I certainly used the bottom gear. Not sure about top. We are two spanish people who are interested in cycling this route. We are having some problem two get bikes. Pick up our bikes from spain is expensive and rent a bike there for doing all the route too. any advice? how did you get the bikes? If by route you mean the full length of the Romantic Road (Romantische Straße) then I am sorry, but I can't help you. 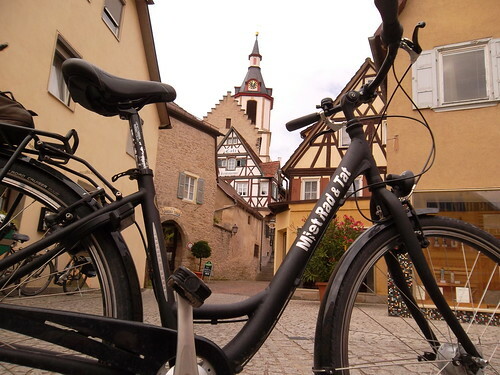 If, however, you mean simply cycling around Rothenburg ob der Tauber then there were a number of places to hire a range of bikes – at least when I was there. 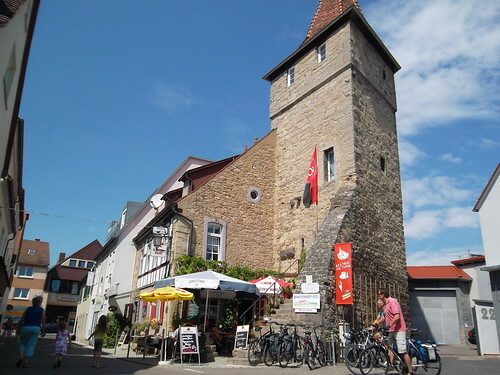 I think Rothenburg ob der Tauber would be a great base of cycling either direction along the Romantic Road. There are also a number of circular routes – so many if fact that together they form the shape of a butterfly in the leaflet I picked up in the town. If I can find it I will add a copy in a comment below.